For reasons I don’t quite understand, Ferrari produced a six-page brochure for its racing cars midway through the Clinton years. It’s collected here in this incredible cache of brochures through the decades, which I strongly encourage you to waste many, many hours on. Included in this brochure are the Ferrari F310 F1 car, the Ferrari 355 Challenge one-make series and the Ferrari 333 SP, the company’s oddball return to endurance racing. It’s easy to remember the F310 now as the car that was at the start of Ferrari’s return to the top of F1. 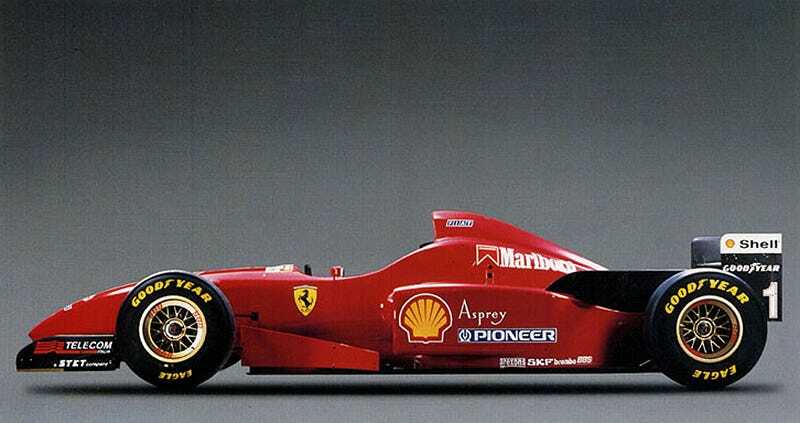 It was the car in which Schumacher got his first win for Ferrari, though it couldn’t beat Williams for the championship in either ‘96 or ‘97. That doesn’t matter much to me now. I’m more interested in the published specs: 600 horsepower for 600 kilos with fluids and the driver. Some 40 valves for its 75-degree, 3.0-liter V10, running through a six-speed sequential. That’s the good stuff. The 355 Challenge car comes stripped and caged, with racing seats, harnesses, fire suppression system, a kill switch, racing suspension, tires, wheels, brake ducts, brake pads, brake lines, and a lightened exhaust and battery. Also there are “strengthened tow points,” which makes sense if you’ve ever seen a Ferrari Challenge race. Though it’s a V8, it also has 40 valves, since Ferrari was still doing five-valves per cylinder at that time. The engine makes 370 horsepower at 8,200 RPM, Ferrari claims, which is nice and neat that the engine weighs 370 pounds. Weight is 2,986 pounds total, and the gas tank holds 21.7 gallons, if you were ever curious. And finally there is the Ferrari 333 SP. This is the good one. This is the classic Ferrari, at least in my mind. You get a 60-valve V12 and a 26.4-gallon gas tank. Everything else is just details. I don’t know why nobody has ever taken one of these things and run flat out across America. I’d say no cop on earth would stop you, but the 333 SP doesn’t exactly look like a typical Ferrari, and everybody would think you’re just a moron in a kit car, not a rakish gadabout in an Italian thoroughbred. Kerb weight for the 333 SP, as Ferrari claims, is a mere 1896 pounds, horsepower is “over 600" at 11,000 RPM. Ferrari was probably a little reluctant to give out precise power info of its then-competitive car, though the company now pegs it at 650. This is a 163 hp/l engine that ran basically flat out for 12 hours at Sebring and won. It is a champion in my heart. But it is not a feature in my garage. Sad. Not Mentioned: The Ferrari F50 GT. Bummer.